I seriously can't wait for These Foolish Things by Deborah Moggach to be re-released as The Best Exotic Marigold Hotel. In case you haven't heard, they are reprinting it to coincide with the release of the film version The Best Exotic Marigold Hotel starring the amazing Judy Dench, mahvelous Maggie Smith, Tom Wilkerson, Bill Nighy as well as the youngster in the group, Dev Patel. Here in the states, the last I heard it won't be released until May 4th but I understand that it's coming out this week, on February 24th in the UK? If it does, PLEASE let me know what you think of it! I've pre-ordered a copy from Barnes and Noble to read on my Nook so I can start as soon as its available, and before I see the movie, obviously. For more on The Best Exotic Marigold Hotel check out my posts: Do you know the original title? In the meantime I thought I would try something else by Deborah Moggach, Tulip Fever, which was optioned years and years ago by Steven Spielberg. I've just started it and I've also found some recent info which just MAY indicate the movie will be made after all! Take a gander at this article in The Independent. In the film, which is based on Moggach's novel These Foolish Things, the character Mrs Ainsley (Penelope Wilton) is seen reading a copy of Tulip Fever. Is this a sign, just like at the end of Notting Hill (1999), when Hugh Grant sits reading Captain Corelli's Mandolin – that book became the Notting Hill team's next movie in 2001? Could a film of Deborah Moggach's 1999 best-seller Tulip Fever at last be just around the corner? Eagle-eyed fans of the author believe that they have spotted a clue, at advance screenings of The Best Exotic Marigold Hotel, the new film of another Moggach novel, starring Judi Dench, Maggie Smith, Bill Nighy and Dev Patel, which is due to be released in the UK in February. Although she is an immensely successful novelist and screenwriter, Moggach would be forgiven for having reservations about adapting Tulip Fever for the screen – again. In 2007, she revealed at the Hay Festival what happened when Steven Spielberg optioned the film of the book. First, the director summoned her to Hollywood, where he discussed the novel's "Danish" setting. (Tulip Fever is set in 17th-century Amsterdam, as any fool could guess.) Then "he said, 'I think it's a comedy about poverty', which it isn't but everyone just agreed". While working on the screenplay, Moggach was constantly badgered to "bring out the comedy" in the rather sad story; then she was replaced as screenwriter by Christopher Hampton (Atonement), who was in turn replaced by Tom Stoppard. Then, in 2004, the then Prime Minister Gordon Brown closed a tax loophole that had encouraged Hollywood filmmakers to work in Britain, and Spielberg's team pulled out, writing off £35m – and 12,000 tulip bulbs had to be given away. The last anyone heard, the film was still in development by a San Francisco-based outfit, Ruby Films, using the Stoppard screenplay and under the directorship of Peter Chelsom (Shall We Dance?). There is no news about the film at the moment, but I'm told that "the producer Alison Owen is determined to make it happen one day." Tulip Fever seems made for the screen, and if The Best Exotic Marigold Hotel is the success that it should be, perhaps it will be revived. However, if the Fox Searchlight Pictures team has copied the end-of-Notting-Hill tease, let's hope that they will not also be imitating the values that went into the making of the film of Captain Corelli's Mandolin. When its author, Louis de Bernieres, was asked how he felt about the film of Corelli, his most famous novel, he replied: "It would be impossible to be happy about your own baby having its ears put on backwards." Poor Deborah Moggach has had enough bad luck with the filming of this book; please someone just turn it into a nice film. Here's my take on Tulip Fever the book. Oh, I'm so interested in seeing this one! I didn't know until just a little while ago that it had been a book first, so I've ordered it in for my bookstore. What a great cast! Also, I didn't know until reading your post that little tidbit about Hugh Grant's character reading that book in Notting Hill. Nifty! It was released in Australia last week. My husband and I went to see it at a jam packed morning session. I think every local pensioner was there! It was a nice movie- I laughed, I cried. The cast were superb of course, the story not as strong I think. Still an enjoyable movie. 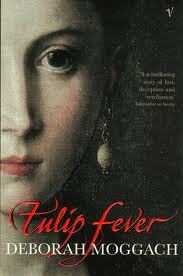 I noticed the Tulip Fever cover (readers will always try to work out what a character is reading, won't they? ), but didn't realise that it could be of any possible significance a la Notting Hill. I thought it was blatant cross promotion. If you know what Hob Nobs are you should take a packet along to nibble one with you when you see it. That is very funny about the pensioners being there!I know just the fact that I'm so excited about this film dates me! I had to google Hob Nobs ... I wonder if they sell them here at the English shop (Tudor House in Santa Monica) ... I'm a Flake gir myself.